Endemic to Lake Tanganyika. It is found only along the southern Tanzanian coastline. It inhabits rocky drop-offs and slopes. 48″ x 15″ x 15″ (120cm x 37.5cm x 37.5cm) – 170 litres. The aquarium should contain scattered piles of rocks arranged to form caves for with large areas of open water. A sandy substrate and good biological filtration are essential. This species does not damage vegetation so plants can be used but are not essential, likewise driftwood pieces. If plants are to be used select hard water-tolerant species such as Anubias or Vallisneria. Will accept most foods but high protein varieties should be avoided. Ensure the fish receive some vegetable matter as part of the diet, such as blanched spinach or spirulina. A relatively boisterous species that requires a lot of space for its size. However, it should be the dominant species in the tank or it will become withdrawn and male fish will lose colour and should therefore be housed only with peaceful species. Do not keep it with mbuna or the like. Cyprichromis sp. and Altolamprologus sp. make good tankmates. Male fish are aggressive towards other males and unless the tank is very large, only a single male should be kept with several females. Male fish are larger and more colourful with longer fins than females, particularly the ventral fins. Possible. Maternal mouthbrooder. A large tank furnished as suggested above is ideal. Large areas of sandy substrate are particularly essential. The fish should be kept in a groups with several females and a single male. Condition them with lots of high quality foods. When ready, the male will excavate a crater-like spawning site in the substrate. The male fish will display around his chosen spawning site, showing intense colour and attempting to entice females to mate with him. He can be quite aggressive in his pursuits and it is in order to dissipate this aggression that this species should be spawned in a harem. When a female is willing, she will approach the spawning site and lay her eggs there, after which she immediately picks them up in her mouth. The male fish has egg-shaped structures at the end of his long ventral fins and the female is attracted to these. When she tries to add them to the brood in her mouth, she actually recieves sperm from the male, thus fertilising the eggs. The female may carry the brood of up to 60 eggs for around three weeks before releasing the free swimming fry. She will not eat during this period and can be easily spotted by her distended mouth. If a female is overly stressed she may spit out the brood prematurely or eat them, so care must be taken if you decide to move the fish in order to avoid fry predation. It is also worth noting that if a female is away from the colony for too long she may lose her position in the pecking order of the group. We recommend waiting at least 2 weeks before moving a female unless she is being harassed. 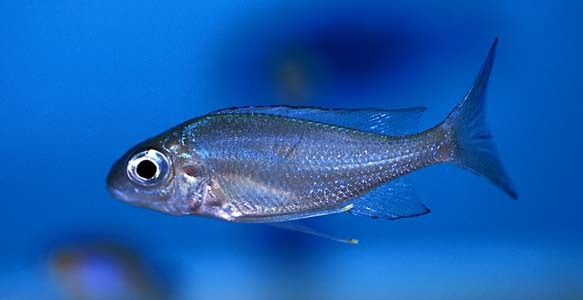 This was the first species to be placed into the genus Ophthalmotilapia.